In his recent study, Gern analyzed the blood of babies immediately after birth and one year later. He was looking for evidence of an allergic reaction, immunity changes, and for reactions to bacteria in the environment. If a dog lived in the home, infants were less likely to show evidence of pet allergies — 19% vs. 33%. They also were less likely to have eczema, a common allergy skin condition that causes red patches and itching. In addition, they had higher levels of some immune system chemicals — a sign of stronger immune system activation.”Dogs are dirty animals, and this suggests that babies who have greater exposure to dirt and allergens have a stronger immune system,” Gern says. In 2008 a study showed that prenatal pet exposure lowered allergic antibody production in the umbilical cord. So….got kids, rescue a puppy or kitten your kids will thank you during allergy season. 2. Pets help you live longer: Studies show that pet owners over the age of 65 made 30% fewer visits to the doctor. In other studies patients that had had heart attacks and had pets to come home to lived longer than those that had no pets. In the Cardiac Arrhythmia Suppression Trial researchers followed 369 heart attack survivors. They found that dog owners had only a 1% chance of dying within a year. That compares to 7% of those who did not have a dog. In a 2009 study it was found that people with a cat were 37% less likely to die of a heart attack than those who did not have a cat. 3. Pets help fight depression and anxiety: They do this in many ways. By providing companionship, keeping you mind focused, by giving sense of purpose, giving unconditional love and building self-confidence. Playing with a pet releases serotonin and dopamine which calms and relaxes. 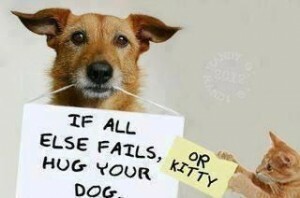 Even the simple act of walking a dog or petting a dog or cat provides a calming stress relief. If you suffer from chronic pain having a pet can reduce the pain by lessening the stress and anxiety. As you age pets bring pleasure and help boost morale and optimism. Taking care of an animal can also provide a sense of self-worth. Adopting an animal from a shelter, especially an older dog or cat, can add to the sense of fulfillment, knowing that you’ve provided a home to a pet that may otherwise have been euthanized. So, pets help you live longer, stay healthier, provide stress relief, lessen allergies, get you out of the house and moving. They also love unconditionally, they make you smile, enjoy your company, and are happy to see you when you come home. Even if you’ve only been gone a few minutes. Why doesn’t everyone have a pet? I know that I really need a dog! Until next time. Here is some more crucial information on pet food. In the last post on the subject I briefly touched on pet food companies using meat from dead or diseased animals. Since then I have discovered that there are two additional D’s to add to the “dead and diseased.” They are disabled and dying. In fact it has it’s own category, 4-D livestock (dead, diseased, disabled and dying) and it’s is not fit for human consumption. However by-products from these 4-D animals are routinely added to pet food unbeknownst to pet owners that believe they are feeding premium food to their fur babies. By-products are the leftover parts of the animal that are deemed unfit for human consumption. These parts include animal pieces such as necks, feet, bones, intestines and lungs. According to http://www.naturalnews.com/ “Normally, these parts of animals would be nutritious for pets. But because they typically come from factory-farmed animals exposed to tainted feces, heavy metals and other toxins, these additives pose a grave health risk. These same animals are also deliberately fed things like genetically-modified organisms (GMOs) and poultry litter, the latter of which is composed of debris and other waste collected from the floors of chicken cages and broiler houses.” Poultry litter … is recycled and fed to cows, and often contains not only uneaten chicken feed, but also feces, feathers, heavy metals and even bits of dead rodents. Obviously no one would ever feed these products to their pets if they knew these details. But because the details are disguised in many popular pet food brands, people are unknowingly feeding what amounts to poison to their pets. What happens when you feed these products to your pet over a long perion of time…… I don’t want to answer that. 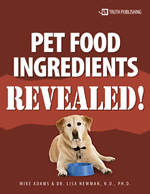 The link below has tons of vital information on pet food ingredients. It lists ingredients from best to worst, by frequency of use and in alphabetical order. I hope this information helps you. Until next time. 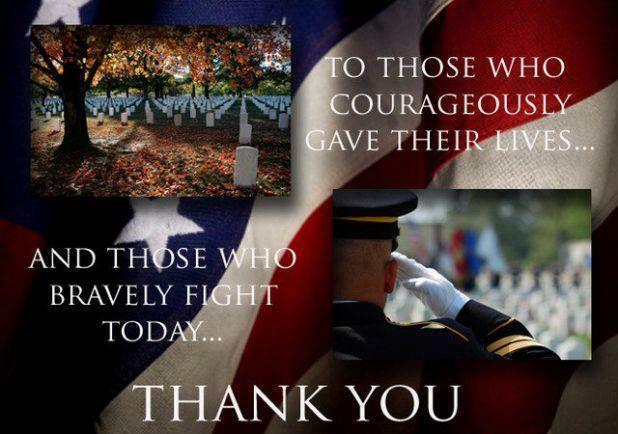 It’s Memorial weekend and everyone is out and about. BBQ’s, boating, swimming, ball games and every summer activity there is will be going on this weekend. You all know to buckle up, put on sunscreen, not to drink and drive/boat but what about your furry little buddies? Here are some reminders for the safety of your pets. DO NOT LEAVE YOU PET IN THE CAR!! We have heard this over and over and yet people continue to do it. Pet Safety Lady and founder of Bark Buckle UP Christina Selter says, “Despite all the warnings against leaving pets and children in cars, yet we still hear all too often the horror stories of dogs that suffered or even died after being left in vehicles as temperatures inside soared. Studies have shown that a healthy dog, whose normal body temperature ranges from 101 to 102.5 degrees, can withstand a body temperature of 107 to 108 degrees for only a short time before suffering brain damage or death, at even 85-degree weather, temperatures inside a car can reach 120 degrees in less then 30 minutes, even if a window is cracked.” Don’t do it! It’s stupid and cruel. Secure your pet properly when in the car/boat: A pet that is unsecured or improperly secured is not only in danger but an injured or scared animal can be a hazard to rescue workers attempting to assist at the accident scene. An animal loose in the car can also be a distraction to the driver of the car. Never let your pet ride in the front seat. For the same reason a child should not ride in the front seat…. mainly, air bags! If your pet is in the back seat and loose he could become a projectile if not properly secured just like a child would. So, what is/are appropriate restraints? There are several. First there are the metal or mesh barriers that go between the front and back seats. They’re better than nothing but all they really do is turn Fido into a big furry ricochet machine in a crash. Then there are the cutesie little booster seats that let small dogs see out the window without being restrained. All those do is make that little dog into a projectile from a foot higher. Next we come to crates. Probably the easiest way for your pet to travel. I could not find much information on crate safety while in a car. I did however find a video of a plastic crate that was seat belted in that exploded on impact in a 45 MPH crash but that is all I could find. If you choose to use a crate, your pet must travel in a crate or they are less stressed, find the sturdiest one you can get and secure it with not only the seat belt but with a couple of heavy duty luggage type straps as well. Finally we come to harnesses. There are many types of harnesses for dogs and cats. Per the safety videos I found some work far better than others. Here’s what to look for. Broad thick heavily padded straps are best. They distribute the force of the impact over a wider area. Straps that run down the chest are even better yet. The Center for Pet Safety http://centerforpetsafety.org/ has done extensive research on pet harnesses and is a vital site for finding the proper harness for your pet. Do not let your pet put their head out the window. I know it’s cute and we’ve all seen the videos with the dogs tongue hanging out and the ears flapping in the breeze but it can be a hazard to you pet. Debris can fly into the eyes, nose or ears of your well harnessed buddy. On longer trips be sure to have food and water on hand. This one is essential. Ice chips are a nice treat and are easy to pack. Pack your pets meds, a toy, vet records, poop bags, etc. Most people carry first aid kits in the car for longer trips so make sure to add stuff for your pets. Please don’t give alcohol to your pet. It is potentially poisonous so skip the booze for Fido. Try to keep your pets normal diet routine to avoid stress and upset stomach. Keep your pet away from matches, citronella candles and lighter fluid, which if eaten canirritate the stomach, lungs and central nervous system. Sunscreen and insect repellant. Make sure to use pet specific or pet friendly products. Finally, use some common sense. Watch your pet around fires, grills and pools. Citronella liquid and candles can be harmful to you pets, If there will be other pets around keep an eye out. Even if your pet is well trained the others may not be. Avoid scraps from the grill. It is important to resist those begging eyes and stick with your pet’s normal diet. Any table scraps, even in the smallest amounts, can result in upset stomachs and potential intestinal obstructions. Certain foods, such as onions, avocado, chocolate, grapes, and raisins can even be toxic to pets. 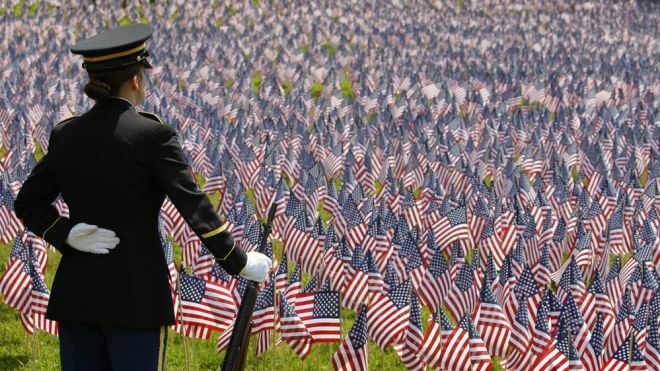 I hope you all have a safe and enjoyable holiday weekend and remember why we celebrate Memorial day in the first place. CCHS has wonderful pets. We currently have Prim, Siamese mix; and Shasta, buff, short hair. More cats coming soon! Available dogs include Bugsy, Puggle; Maximus, Bull Mastiff mix; Trinity and Boone, Staffordshires; Ollie, Beagle; Dexter, Shepherd/Dane mix. Dogs are fostered with families and can be visited by appointment or at the next Meet and Greet from 10 a.m. until noon Saturday, May 17. Send $5 for each date you reserved with your name to CCHS, 1301 Apple Lane, Breese 62230. 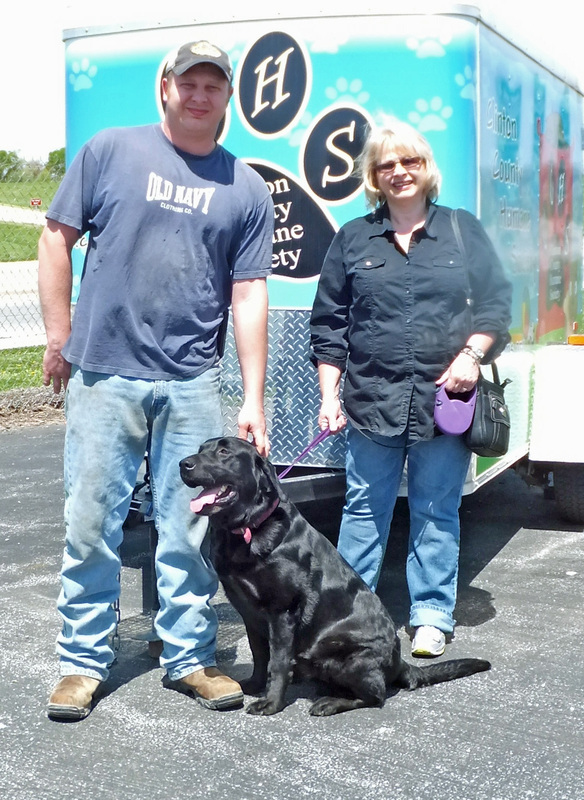 Charley will have lots of room to run at his new home with Dan and Angie Wilke. 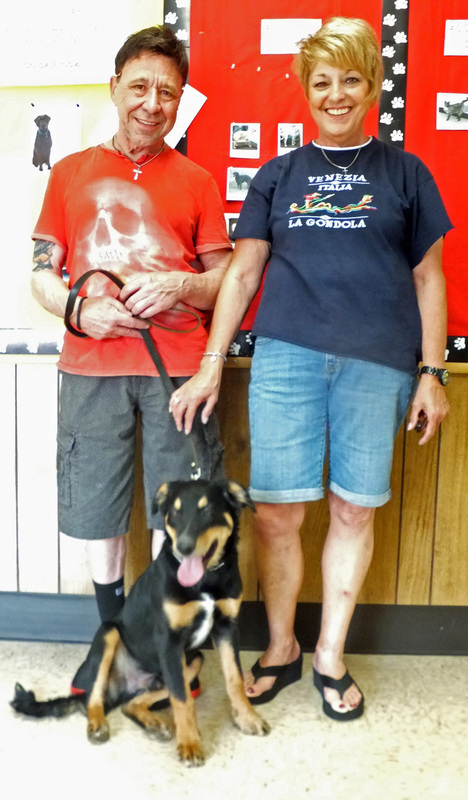 Kali went home with her new mom Joni Steinhauer and her canine friend Freddie. 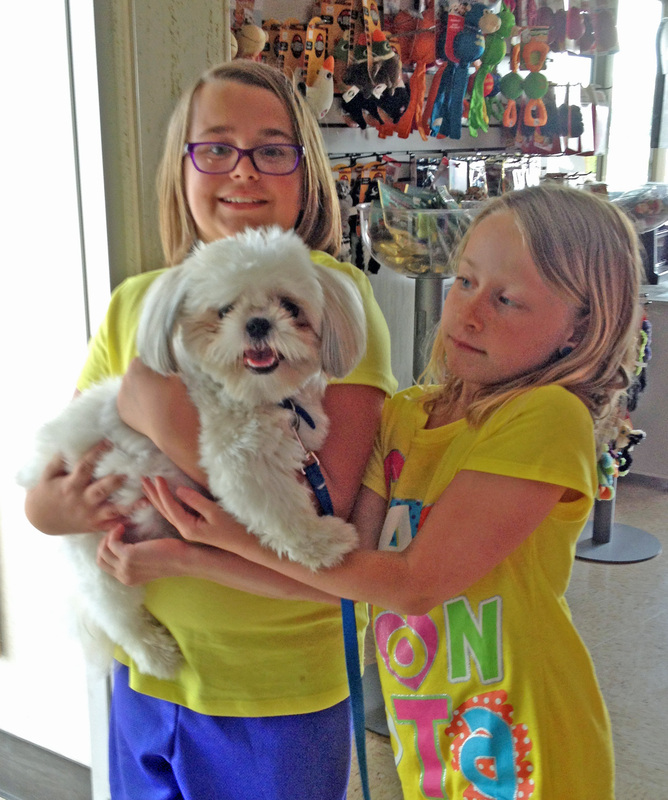 Toby will get lots of love from his new girls Angie and Kelsey Nicklin. 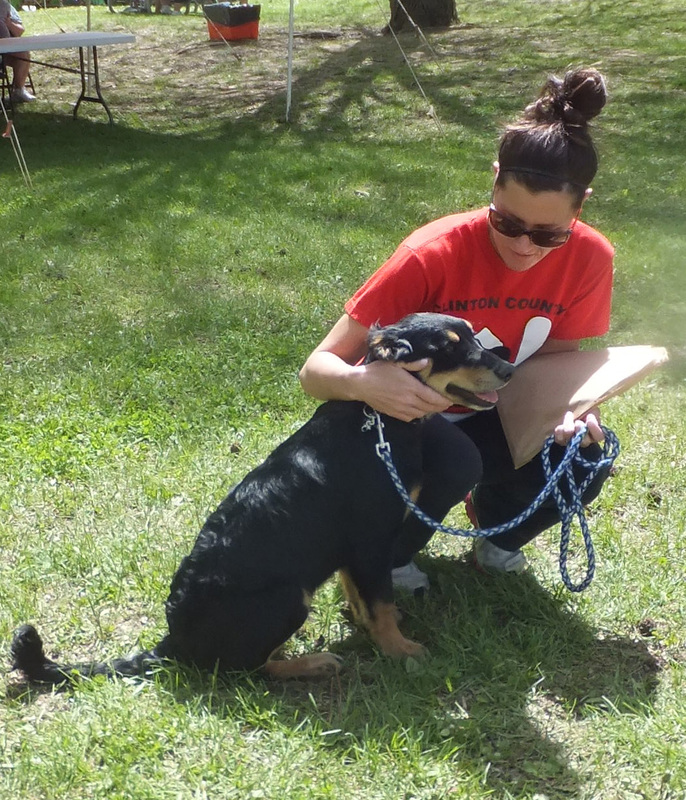 An ASPCA grant makes the “Tag in Time, Saves your Canine” program possible. The CCHS has announced that they are the proud recipients of a $3,000 grant from The American Society for the Prevention of Cruelty to Animals (ASPCA). The grant money will fund the “Tag in Time, Saves Your Canine” program aimed at encouraging pet owners to ensure that their animals have proper identification tags. “Having a tag on your pet helps ensure a quick and safe return in the unfortunate event that it is lost. CCHS wanted to ensure that there is a local and affordable option for pet identification tags. We are so proud to have received assistance from the ASPCA for this project,” said Deb Wesselman of CCHS. The grant funds allowed CCHS to purchase a tag engraving machine. Tags will be available for newly adopted pets and pets in the community. Tags come in different sizes, shapes and colors and cost $6 for one engraved side and $7 for engraving on both sides. BE SURE to have your pet checked for heartworm and make sure he is on heartworm preventative and flea and tick control!! SPAY AND NEUTER YOUR PETS! It will help control overpopulation of unwanted pets and will make your pet healthier and happier. Don’t forget to make sure your pet has protection from the sun, fresh water and plenty of food on hot days. Never leave a pet untended in a car which will heat up like an oven in a very short time. The CCHS May Special is junior tanks for only $8. Originally $12, they come in four sherbet colors including green, pink, blue and orange. Just arrived Dog Gone Smart lounger beds in five sizes and colors are available at specially discounted prices. CCHS holds Meet and Greets the first and third Saturdays of each month. 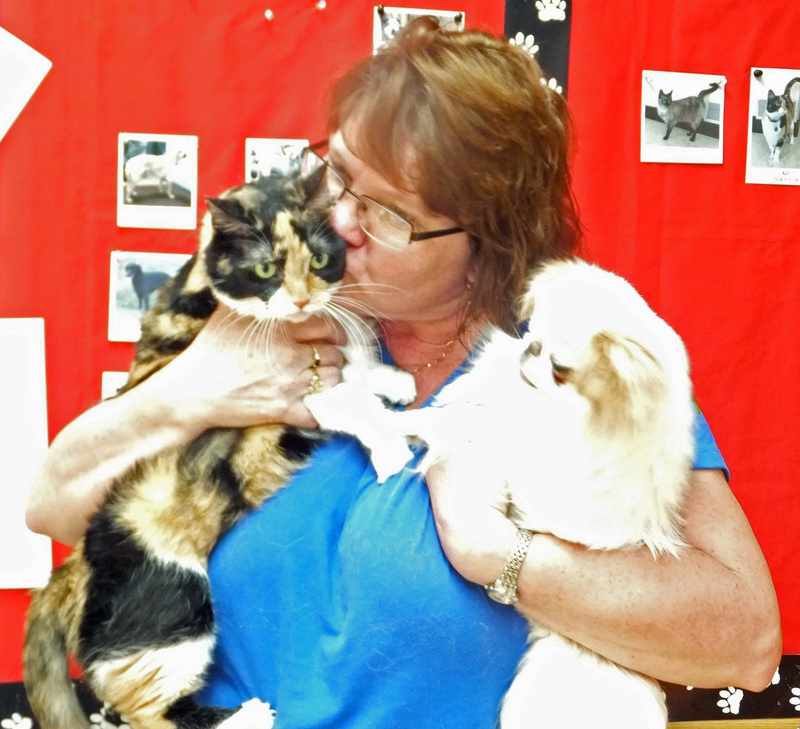 Folks can stop by and meet the CCHS adoptable pets from 10 a.m. until noon Saturday, May 17. Micro-chipping for your pet will also be available for $25, including registration. The next regular CCHS meeting will be held Wednesday, May 14, at 7 p.m. at Knotty Pine. Meetings are open to the public and new members are always welcome. Pet food: what to look for and what to avoid. This blog started as an endeavor to find the best dog and cat foods for your pet. It turned out to be quite the undertaking! Finding unbiased reviews wasn’t as simple as I assumed it would be. So after perusing seemingly endless opinions, recalls (which seems to be a huge problem) and reviews what this post ended up being is guidelines for assisting you in your search for the best food for your pet that fits into your budget, your geographical location, (assuming anyone other than me reads this) and just how much effort you want to put into feeding your pet the highest quality food. At the end of this article you will find links to some of the better reviews I found in my search. I hope this helps you find some yummy and healthy vittles for your furry friend. First lets look at what you WANT to see on your pet food label. 1. Human grade (USDA approved) ingredients. This is a tricky one. Why? Because the Association of American Feed Control Officials (AAFCO) has very effectively prohibited the use of the term “human grade” on pet food packaging. You won’t see the term on many brands of pet food. According to TheBark.com: “AAFCO says “human-grade” is false and misleading, and constitutes misbranding, unless every ingredient in the product—and every processing method—meets FDA and USDA requirements for producing, processing and transporting foods suitable for consumption by humans, and every producer of the ingredients is licensed to perform those tasks. Few pet food companies can meet these criteria.” So despite not using the term “human grade” you will be able to tell the quality of the ingredients because the pet food companies WANT you to know why you are paying more for their product. Usually, the better the brand name, the more likely the ingredients are “human grade.” Another indicator is if the protein source is either free-range or pasture-raised and hasn’t been shot full of hormones and antibiotics. 2. Grain Free. Dogs and cats are carnivores and they have no biological need for grains or carbs. Also, don’t be confused by the addition of potatoes. Although potatoes are a starch not a grain companies will include potatoes grains and other carbs to offset meat content. 3. AAFCO guarantee . Although the AAFCO does not regulate, test, approve or certify pet foods in any way it does set the industry standards. Per the AAFCO website: AAFCO establishes the nutritional standards for complete and balanced pet foods, and it is the pet food company’s responsibility to formulate their products according to the appropriate AAFCO standard. What all that means is that although the AAFCO has no statutory authority it puts the pressure on the industry to make better, healthier products. 2. Poor quality, incomplete proteins. These include corn gluten meal, wheat gluten meal, rice protein concentrate and soy protein. 3. Formulas containing corn, wheat or soy. In pets, corn, wheat and soy are common allergens for dogs and cats. They are also poorly digested by pets, They are used as a cheap (but incomplete) source of proteins in inexpensive foods. 4. BHT, BHA, ethoxyquin, propyl gallate. Artificial preservatives used to extend shelf life and reduce fat spoilage (rancidity). According to the National Institute of Health, BHA in the diet has been found to consistently produce certain types of tumors in laboratory animals. Ethoxyquin is a chemical preservative – and possible carcinogenic – regulated by the FDA as a pesticide. While ethoxyquin cannot be used in human foods, it continues to be used in many pet food brands. Ethoxyquin has been found to promote kidney carcinogenesis and significantly increase the incidence of stomach tumors and enhanced bladder carcinogenesis, according to several studies, including a recent one by The Department of Pathology, Nagoya City University Medical School, Japan. Here is a list of websites with a lot of good information of pet food. I hope all of this helps you. I know it helped my optometrist because I need new glasses after staring an the computer screen for all those hours!! Til next time. 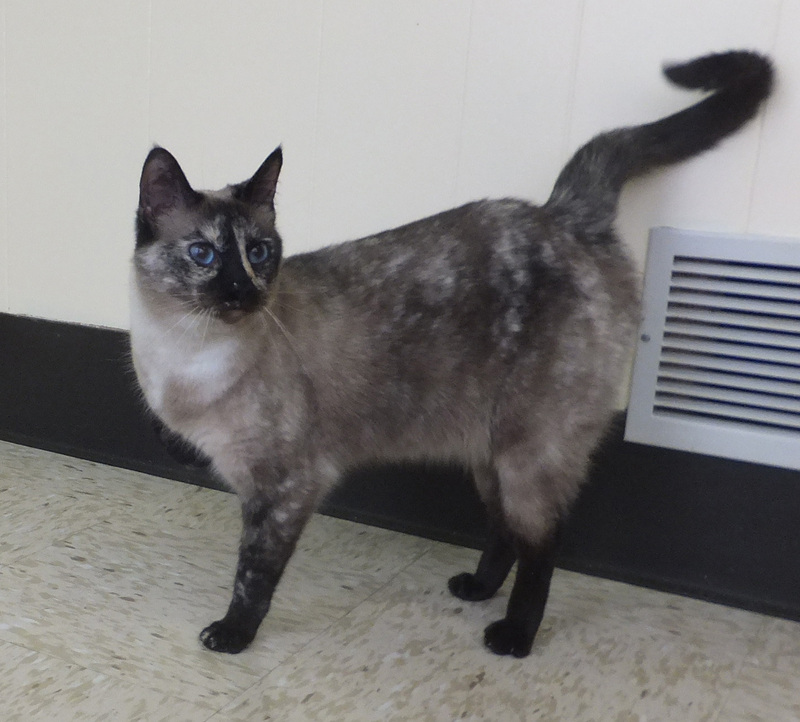 Prim, 2-year-old Siamese mix, is a beautiful cat. She is people-friendly and likes to be petted. She prefers a peaceful, calm environment. Prim is up-to-date on shots, spayed, litterbox trained, feline leukemia negative and micro-chipped. If Prim sounds like the gal for you, fill out an application at www.ccilhs.org or pick one up at the CCHS building at 1301 Apple Lane, Breese. CCHS has other wonderful pets. After a month-long hiatus, the cats are returning to CCHS. We currently have Prim, Siamese mix, and Kali the Calico. More cats coming soon! Community Link hosted the CCHS Meet and Greet Saturday, May 3, during the 8th Annual Community Link Buddy Walk. 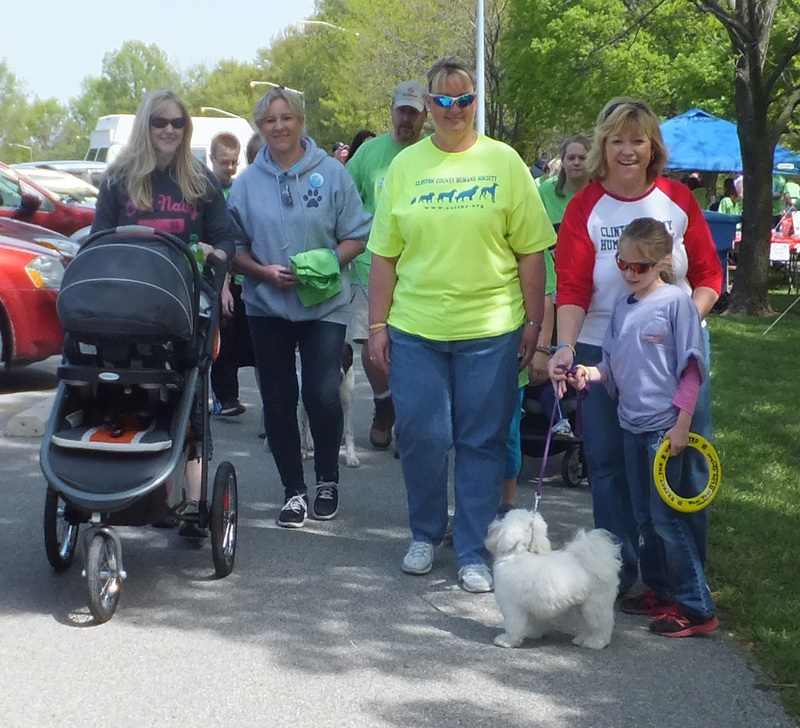 Folks could meet CCHS adoptable pets from 10 until noon and participate in the Buddy Walk at 10:30 a.m.
CCHS volunteers Brianne Robke, Colten Robke (in stroller) Nita Foster, Sharon Kellermann, Ellen Huegen, Jordyn Robke (front) and Toby the ShihTzu participated in the Community Link Buddy alk at Carlyle Lake Saturday, May 3. 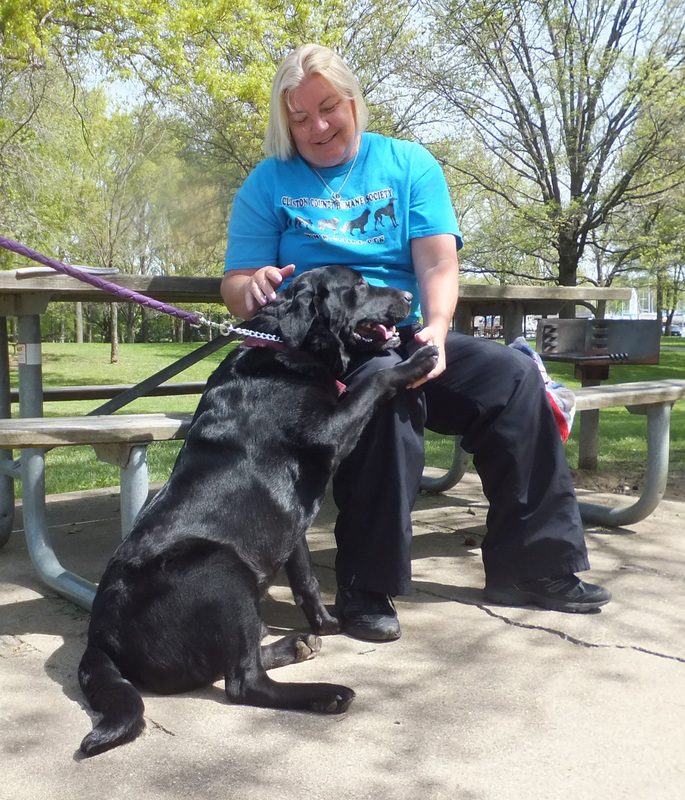 Maxx (now adopted) debuted at the Buddy Walk with foster Ronda Dasenbrock. 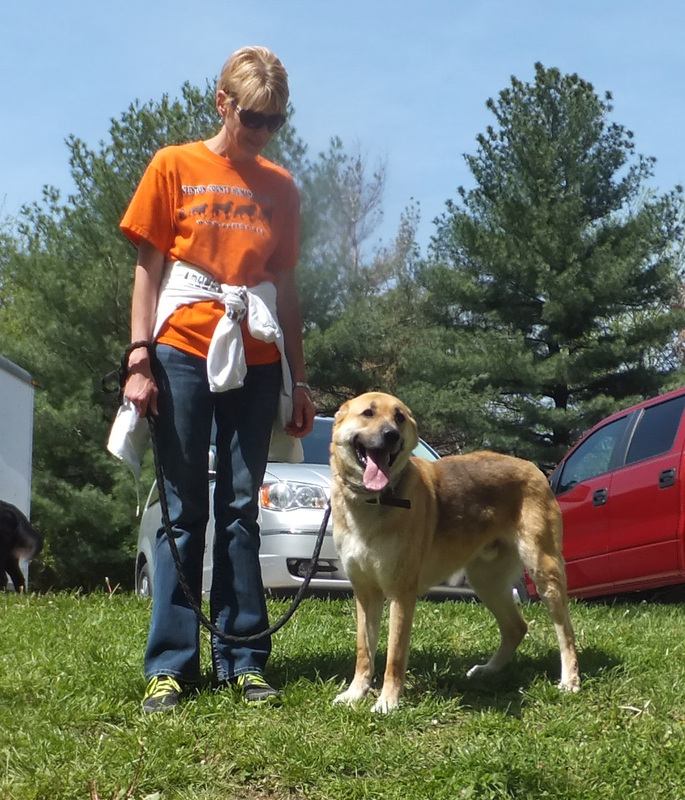 Charley (now adopted) loved the attention he got from CCHS Volunteer Diane Holtmann at the Meet and Greet. Kaylee Albers was in charge of Toby the Shih Tzu for a bit at the Meet and Greet. 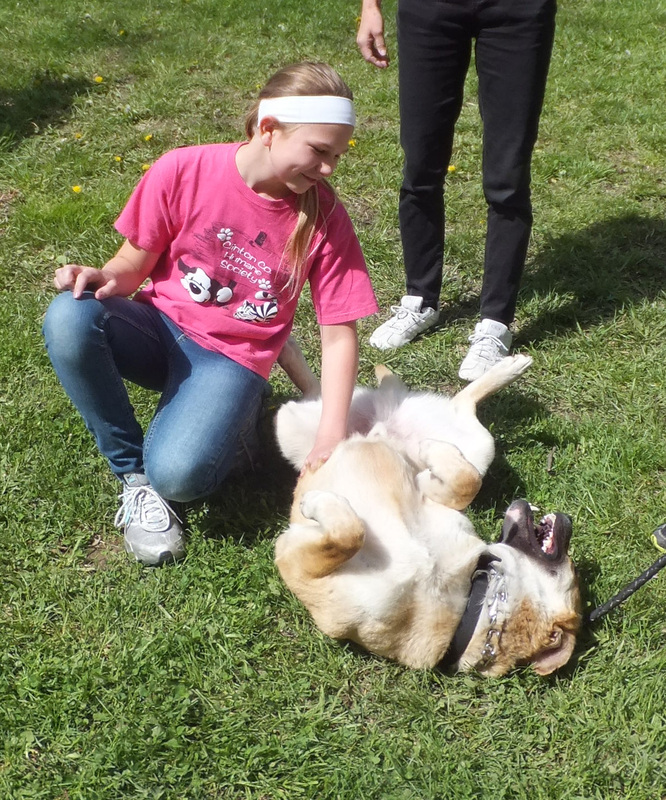 Trinity enjoyed a little chin scratching from handler Ashley Hinz. 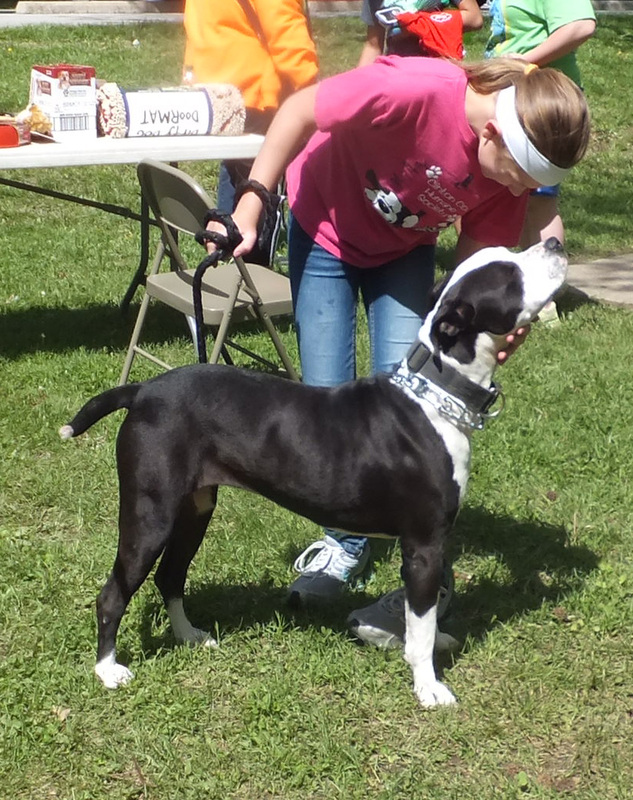 Nancy Tebbe brought Dexter to his first CCHS Meet and Greet Saturday. 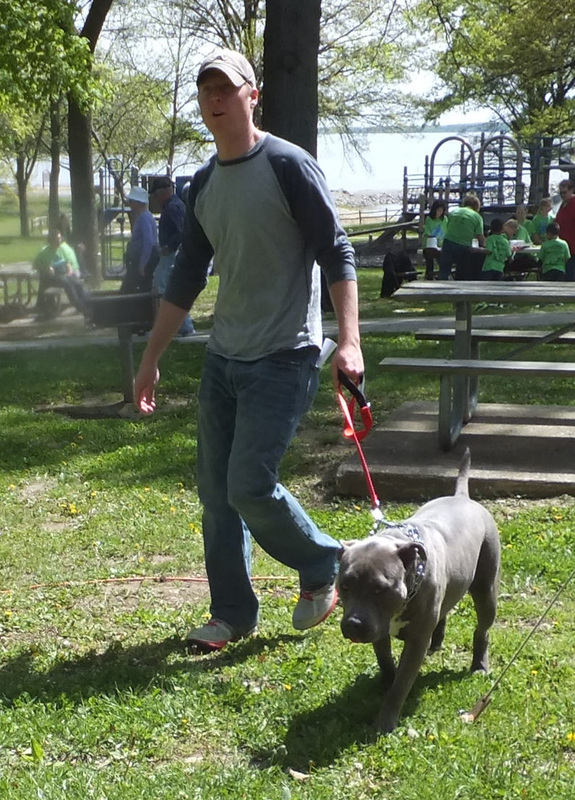 Josh Winkeler and Maximus took a stroll around the park at the Meet and Greet at Carlyle Lake. Dexter loves a good tummy rub from Ashley Hinz. Yikes! The shedding is out of control! Some folks consider shaving a pet to help with the shedding problem. Before you make that decision, check with your vet to make sure that is a good idea. A pet’s coat doesn’t just keep him warm. In the summer it also protects him from the heat. A dog has more sensitive skin than most folks think. Without his coat he is susceptible to painful bug bites and sunburn. Shedding can be controlled with a few minutes of daily brushing. Not only does the brushing collect hair that would be on your floors and furniture, but it also is a great bonding time for you and your pet. Pets sometimes wander off unexpectedly or run during a storm. If your pet is wearing a tag with his name and your phone number, all it will take to get him home is a phone call. Cheap and easy! Another good way to improve your pet’s chances of getting home is to microchip him. A collar and tag could be lost, but a microchip is actually inserted under your pet’s skin. This tiny implant carries a number to identify your pet. The company where the chip is registered will contact you if your pet turns up at a vet, shelter or the police.Micro-chipping costs a little more, but chances are it will never be lost and will last for the life of your pet. Friday. The store will be closed Saturday and Sunday evenings. C.C.H.S. has Dog Gone Smart Lounger Beds with Repelz- It™ on sale at extremely low prices! We’re very close to wholesale on these awesome pet beds. Dog Gone Smart uses Repelz- It™ Nanoprotection to keep pet beds looking and smelling clean, even after years of use! 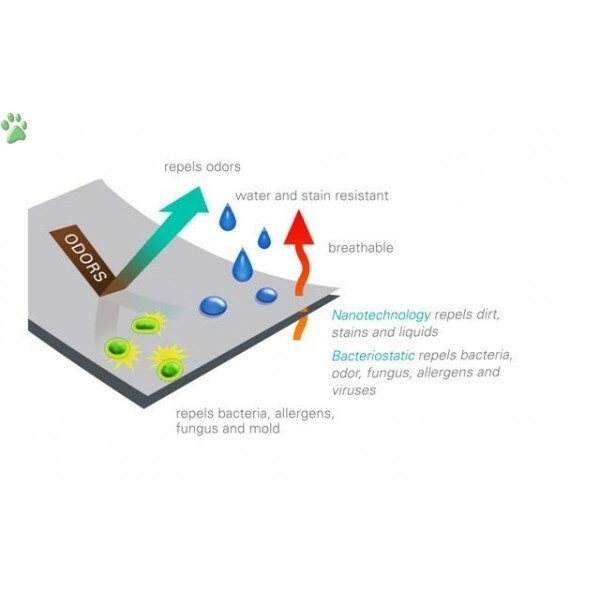 Repelz-It™ uses both nanotechnology and a state-of-the art bacteriostatic to keep stains, dirt, liquid, bacteria and pet odors from clinging to the fabric. Repelz It™ Nanoprotection is pet-safe and APA approved. HURRY, THEY WON’T LAST! !